Blacksmithing artist Chris Gavin is fond of noting how the elegant lines of his pieces flow into each other so seamlessly that it's difficult to tell where one begins and another ends. He continually refers to the rhythm and flow of the metal and often compares a design to the natural world. "I want the eye to move around a piece, to follow the line," he says, picking up a work in progress, a picket for an interior stair rail. "The line is like a river- wide and deep in some spots, narrow and shallow in others." The 38-year-old Scotsman calls nature his "greatest mentor." An avid world traveler, he also draws inspiration from the man-made beauty of architecture, from French chateux to Tibetan temples. His ideas take shape in a forgotten industrial park at the bottom of Union Street, in the Woodberry section of Baltimore, where he pounds and chisels red-hot steel and other metals into tools, furniture and sculpture. 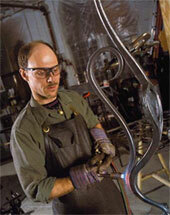 His artistic works are a far cry from what most people associate with blacksmiths. "I don't do horseshoes," he quips. His recent work has focused heavily on home furnishings: intricately detailed and sinuously curved beds, consoles and accent tables, fireplace screens, hanging shelves and chandeliers in a mixture of metals. Prices can start at $1,800 for a set of fireplace tools and rise as high as $18,000 for an elaborate four-post bed. Gavin prefers to maintain control over how a whole piece will look, beyond his metalwork. When a client decided to top a table with a slab of marble, for example, Gavin chose the marble and supervised its cutting. Local designer Jeannine Feeney, for whom Gavin has designed consoles as well as beds and desks, praises him as a master craftsman. "He is extremely creative and his work is impeccable," she says. "Moreover, his pieces vary; he doesn't use the same motif over and over again." Packed with equipment and filled with the smells and sounds of hot metal being worked, Gavin's studio is a testament to the labor-intensive nature of his art. In the back is a lathe he uses to make all his own tools. Stacked on one wall is the raw stock- cylindrical steel rods in a variety of sizes. And in the middle, his essential equipment: a black-box forge for making the metal malleable, two power hammers (he equates the more powerful one with having a 140-pound arm) and an anvil, all of which he uses to give texture and character to metal. There are countless chisels for cutting and incising the details. Near the studio entrance is a drawing board where the creative process begins. "Everything I need to know about the work is there," Gavin says, pointing to a meticulous paper sketch of a table that he has tacked onto his blackboard. "The challenge is translating a two-dimensional drawing into three-dimensional metal." That's were Gavin's sculptural sensibilities come into play. To help others make that leap, he plans to convert a storage section of the studio into a showroom, where prospective customers can see an example of his work. "There's no substitute for actually seeing a finished work," he says. Gavin came to Baltimore from his native Edinburgh to study sculpture at the Maryland Institute College of Art. After teaching himself the ancient art of blacksmithing through classes, conferences and books, he founded his own company in 1995. Its name, Mandala Creations in Metal, was inspired by an around-the-world trip that led him to Nepal and a fascination with Buddhism. For Buddhists and Hindus, the mandala, a circular symbol filled with concentric geometric designs and religious images, represents the universe and wholeness. "For me," says Gavin, "the mandala is a visual symbol of my focus, and that focus is to create high-quality, artistic work in metal.